“Mark Your Calendars: What’s on Sale When.” From Consumer Reports, provides a nice month-by-month rundown of what to expect on sale. Good bets for this month include digital cameras and small consumer electronics. – Kids on Spring Break? Take a look at Portland Parks and Recreation Spring Break Fun, which offers plenty of cheap drop-in activities and some free ones too, see web site for details. Runs Monday – Friday. – Book reading “The Story of Stuff,” which “tracks the life of the ‘stuff’ we use every day, from extraction through production, distribution, consumption, and disposal.” 7:30pm at Powell’s City of Books. Free. – Someday Incubator, 9:00pm – midnight at the Someday Lounge, free. 21 and over only, sign up for some stage time or just go to check out a variety of open-mic acts and performances. Repeats most Tuesdays. – Ben and Jerry’s Free Cone Day! 12:00pm – 8:00pm, get one scoop for nada, zilch, zero, gratis! 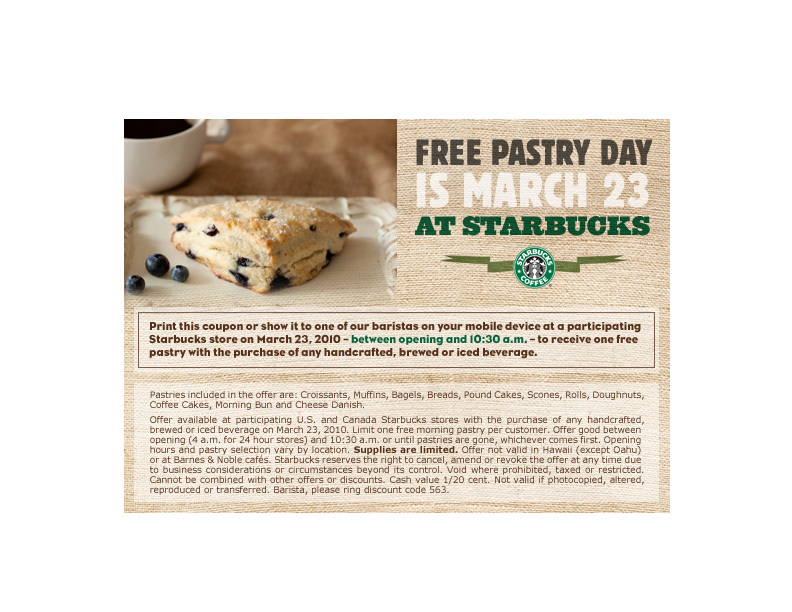 – Starbucks Free Pastry Day…well, kind of. You have to buy a beverage and you’ll need this coupon and present it to your barista. One more requirement: you’ll need to redeem it before 10:30am. – Diversity Employment Day Career Fair, 11:00am – 3:00pm at the Lloyd Center Doubletree Hotel. Free admission. – Catch some tunes by Emily Herring at McMenamins White Eagle Saloon starting at 8:30pm. Free, 21 and over only. – Last Thursday on Alberta Street. There is no official web site, so get the low down from Yelp or read this recent article from the Oregonian about this monthly affair. This entry was posted in Week on the Cheap and tagged Ben and Jerry's Free Cone Day Portland, Last Thursday Portland, Portland Diversity Employment Day Career Fair, Someday Incubator, Starbucks Free Pastry Day Portland. Bookmark the permalink.